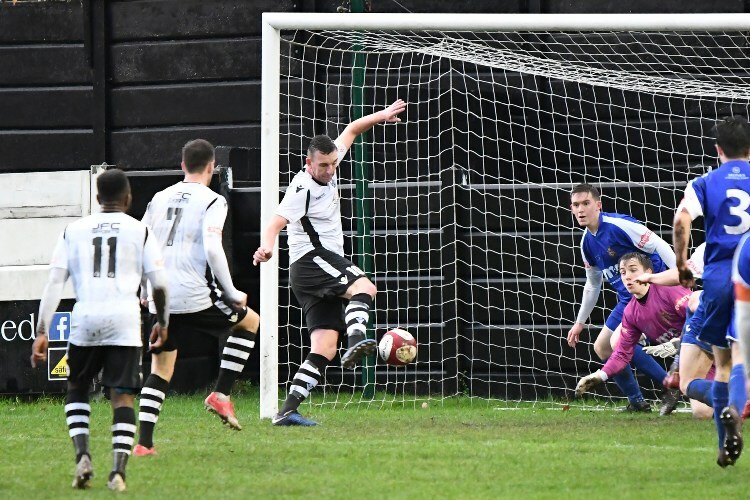 Mossley returned to winning ways at a very wet Seel Park on Saturday as they overcame the challenge of old rivals Clitheroe with a goal in each half to record a hard earned 2-0 victory. The visitors opened brightly and kept Mossley pinned in their own half in the early stages but when the Lilywhites finally got into their stride they looked the more threatening. Mossley opened the scoring on 23 minutes. Clitheroe keeper Cameron Terry could only claw Kieran Nolan’s dipping deep right wing cross from under the bar into the path of Ben Halfacre who smashed the ball into the roof of the net from close range for his 10th goal of the season. Clitheroe’s response to the goal was instantaneous as Harry Blackburn saw his effort strike the bar and moments later following a corner Kyle McGonigle brilliantly cleared Derek Ubah’s goal bound header off the line. Clitheroe enjoyed the lions share of possession in the half but were unable to find a way through a solid Mossley rearguard. Mossley came close to doubling the lead before the break but Leonard’s inch perfect through ball saw Halfacre fire a powerful shot narrowly wide. The second half saw Mossley on to. Andy Keogh, Godwin Abadaki and Halfacre all came close for the Lilywhites before the lead was finally doubled in unlikely circumstances on 53 minutes. Ben Richardson whipped in a low left wing corner kick that somehow eluded the front post marker and found the net for his first goal of the season. Clitheroe ran out of steam and ideas following the second goal and Mossley managed the game well through to close and created several more chances. Abadaki, Leonard and Mike Fish all coming close and a Ben Richardson free kick clipped the bar as Mossley ran the clock down and ran out convincing winners in the end.